A veda-samskrita pathashala was started in the latter half of 19th century by Sri. Ataviswami. Then, the next mathaadhipati Srimad Uddaana Shivayogi, formally established Sri Siddhalingeshwara Samskrita Pathashala in June 1917. Initially, the pathashala had a single teacher and 16 students. 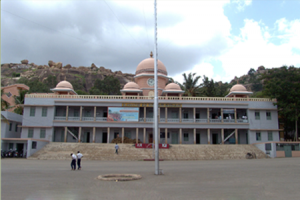 By the efforts of the current Mathaadhipati, Sri Sri Shivakumara Mahaswami, the pathashala was converted to a college in 1938. Currently, the college imparts Samskrit education from the primary till Vidvat level. More than 6000 students are studying Samskrit here, and the college contains about 50 lecturers. The college has its own building, built in 1955, and also a research building, built in 1972 on occasion of Golden jubilee. The building has a big auditorium, and also a press associated with it. Silver jubilee of the college was celebrated grandly in 1947. A commemorative volume called ‘Kirana’ was released on the occasion. Golden Jubilee was celebrated in 1972, and Diamond jubilee in 1982, on which occasion a commemorative volume called ‘Suraganga’ was released. Platinum jubilee was celebrated in 1997, with the commemorative volume ‘Amritavarshini’. The college is nearing its centenary (2017), and is probably the largest Samskrit college in India today, with 6262 students enrolled in the current year. Illustrious alumni of the college – Vid. M G Nanjudaradhya, Dr. G Marulasiddaiah, Sri Shivarudraswami of Kagalawadi muth, Dr. G S Shivarudrappa, Prof. Mallepuram G Venkatesha. The college has a vast, well-equipped library, with about 20000 books in Kannada, Samskrit, English and Hindi languages. The collection includes books related to Veda, Aagama, Puraana, Vyaakarana, Alankaara, Nyaaya, Vedaanta, Darshana, Jyotishya and other shaastras. It also contains hundreds of Manuscripts and Palm leaves, useful for research. There is a reading room associated with the library, where all major periodicals in Samskrita, English, Kannada and Hindi are available. The college also has a free hostel which provides free food and lodging facilities for students pursuing their studies and research in the Samskrit college.